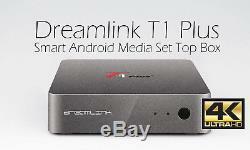 Dreamlink T1 Plus Smart Android Media Set Top Box superior than MAG254 or Avov. Please note: there will be no subscriptions, activations, TV Channels or any other audio/video content provided with the unit. Dreamlink T1 Plus IPTV Set Top Box Smart TV Main Features COMPLIANT WITH ALL KINDS OF STALKER SERVERS AND ALSO EMULATORS VARIOUS APPS DOWNLOAD FROM DREAM MARKET SERVER, GOOGLE APK STORE AND IN ADDITION THE USB PORT THE LATEST IPTV/ANDROID EXCLUSIVE QUAD CORE CPU PROBABLY THE MOST OPTIMIZED ANDROID LIBRARY FOR IPTV BY DREAMTEAM EXPERIENCED AT VARIOUS OPEN ANDROID APPS EXTERNAL USB SUPPORTING TIME SHIFT AND ALSO LIVE RECORDING OR PLAYBACK. TRUE PVR FEATURES AS TIMESHIFTING, INSTANT RECORDING, AND ALSO RESERVED RECORDING. GOOGLE LOG IN AND IN ADDITION GOOGLE APK STORE FOR ALL KINDS OF APK INSTALLATION. GRID EPG AND SINGLE EPG SUPPORT MAXIMUM 14 DAYS. CATCH UP TV FEATURE FOR REBROADCASTING CHANNELS IN ADDITION TO NEW PRV FUNCTION SUPPORTS TV-SERIES CHANNELS AND CHANNEL SEARCH AT VOD MENU SUPPORTS CHANNEL BUFFERING FOR WEAK SIGNAL CHANNELS FOR LESS FREEZING SUPREME ULTRA-HD LEVEL PICTURE QUALITY COMPARED WITH OTHER IPTV BOXES. USERS AND ALSO INSTALLERS FRIENDLY SIMPLE GUI INTERFACING QUAD-CORE ARM CORTEX A7 UP TO 1.5 GHZ DOMINANT FREQUENCY INTEGRATED MULTIMEDIA ACCELERATION ENGINE NEON HARDWARE JAVA ACCELERATION INTEGRATED HARDWARE FLOATING-POINT COPROCESSOR QUAD-CORE MALI450 OPENGL ES 2.0(3D VIDEO PROCESSING)/1.1/1.0 OPENVG 1.1 AND ALSO EGL VIDEO DECODING IN H.
264, AVS+, MVC, MPEG2, MPEG4, VC-1, VP6, AND ALSO VP8 POWERFUL COMPATIBILITY THROUGH EMBEDDED ANDROID OS (KITCAT 4.4.2) USB 2.0 DUAL HOST PORTS MICRO SD CARD SLOT SUPPORT HDMI VIDEO & ALSO AUDIO OUTPUT ETHERNET PORT SUPPORTED SOFTWARE & ALSO SERVICE DATABASE UPGRADE VIA USB AND IN ADDITION ETHERNET AS MUSH AS UNDER 0.5W STANDBY POWER CONSUMPTION HTML 5.0 SUPPORT ONE SD OUTPUT AND ALSO ONE HD OUTPUT FROM THE SAME SOURCE OR DIFFERENT SOURCES ON-SCREEN DISPLAY WITH FULL COLOR AND ALSO RESOLUTION FULL FORMAT 3D VIDEO PROCESSING IN ADDITION TO DISPLAY ULTRA-LOW-DELAY VIDEO PROCESSING LOW NOISE REMOTE CONTROL AND ALSO LEARNING REMOTE Your Dreamlink T1 plus contains Dreamlink T1 Plus. User Manual Power supply HDMI Cable Learning Remote Control. 1 biz day hanling is guaranteed, But we have achieved. Orders paid between 12:30pm to 3:00pm PDT could be handled same day depends on the workload. Duty Rate is varying subject to different countries' regulation. For a Return Merchandise Authorization. We advise you to use a reputable carrier service when returning your goods. For example, the returning&###xA0;item&###xA0;not in original condition. &###x200B;&###x200B;&###x200B;&###x200B;&###x200B;&###x200B;&##x200B. &###xA0;because it is the quickest, easiest and most secure way to pay for your goods or services online. We will do our best to make you have a wonderful purchasing experience. We guarantee that your issue will be solved quickly. Your feedback is very important to us for improving our service. Our customer service contact information is on the invoice with your package. Please keep it for your sake. To resolve any problem you meet. There are always win-win solutions. To resolve any disputes among human beings. The item "Dreamlink T1 Plus Smart Android Media Set Top Box superior than MAG254 or Avov" is in sale since Monday, November 20, 2017. This item is in the category "Consumer Electronics\TV, Video & Home Audio\Internet & Media Streamers". The seller is "tekcenterusa" and is located in Torrance, California. This item can be shipped to United States, Canada, United Kingdom, Denmark, Romania, Slovakia, Bulgaria, Czech republic, Finland, Hungary, Latvia, Lithuania, Malta, Estonia, Australia, Greece, Portugal, Cyprus, Slovenia, Japan, China, Sweden, South Korea, Indonesia, Taiwan, South africa, Thailand, Belgium, France, Hong Kong, Ireland, Netherlands, Poland, Spain, Italy, Germany, Austria, Russian federation, Israel, Mexico, New Zealand, Singapore, Switzerland, Norway, Croatia, Brazil, Colombia, Barbados, Bangladesh, Bermuda, Brunei darussalam, Bolivia, Ecuador, Egypt, French guiana, Guernsey, Gibraltar, Guadeloupe, Iceland, Jersey, Jordan, Cambodia, Cayman islands, Liechtenstein, Sri lanka, Luxembourg, Monaco, Macao, Martinique, Maldives, Nicaragua, Oman, Peru, Pakistan, Paraguay, Reunion.